This section provides an introduction to autofocusing in SerialEM then describes strategies for dealing with various kinds of autofocus problems. Autofocusing is done in SerialEM with the classic method of tilting the beam and measuring how much the image shifts. That operation is illustrated in this diagram. 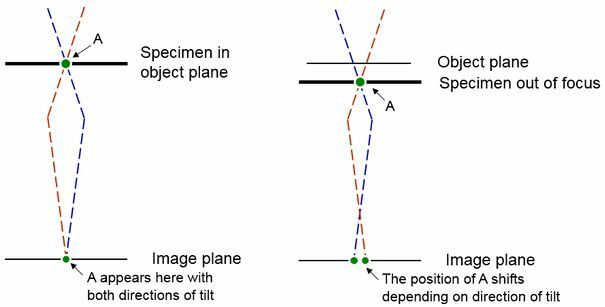 On the left, the specimen is in the object plane, and a particular point on the specimen always projects to the same point in the image plane regardless of the beam tilt, provided that the pivot points in the optical system are properly aligned to achieve this. On the right, with the specimen out of the object plane, differently tilted beams passing through the same point on the specimen project to different places in the image plane, and thus the image appears to shift when the beam is tilted. In the diagram, the image will shift by a distance proportional to the distance between the points where the two tilted beams cross the object plane. The amount of shift will thus be approximately proportional to the distance from focus, and also to the amount of beam tilt. After the autofocus routine measures the current defocus, it changes the defocus by the amount needed to reach the target defocus that you have selected; typically a few tenths of microns of underfocus for stained samples and several microns for cryosamples (with negative numbers for underfocus). However, if the change is very large, the program will limit the change to a set amount (16 microns by default) and repeat the operation. It may take several iterations to change focus, and the program may even abort the operation if inconsistent results are obtained during these iterations. Three variations on the autofocus operation, available in the Focus menu, are useful when setting up autofocus or diagnosing problems with it. None of them require an autofocus calibration to exist yet. Report Shift & Drift : This command will take the three images, correlate them, and report its estimates of the shift induced by beam tilt and the amount of drift. Report On Existing : This command works with three images already present in the A, B, and C buffers from an autofocus operation; it correlates them and reports the shift and drift. Show Existing Corr : This command also works with three existing images; after correlating them, it displays the cross-correlation between two of them. There are several reasons why autofocus can be inaccurate or fail to work, addressed in the following sections. Since we are measuring shifts between successive images, one source of inaccuracy is specimen drift. This inaccuracy can be reduced by taking three images, with a positive, negative, and positive beam tilt. The drift can be estimated by the shift between the first and last image and subtracted off to determine just the shift induced by the beam tilt. The option to take three images is set with the Drift Protection entry in the Focus menu and should be left on unless there is a good reason to turn it off. If the drift is constant over time, then this procedure will eliminate its effect. More likely, it declines between the first and second pair of pictures, such as when the stage settles from tilting, so there may still be some residual effect from drift. To reduce that effect, try to minimize the interval between images. With older styles of CCD camera, this is accomplished by taking a subarea with binning, as well as by having a fairly short exposure time. With a direct detector, it is more difficult to get fast images because the full chip is read out regardless, and binning and subarea extraction occur in software. With some newer CCD cameras, particularly fast-readout ones, using a subarea and binning make relatively little difference, but the images are fairly fast anyway. Nevertheless, there are other advantages in using smaller images that still apply with all cameras. Improve the gain-normalization of the camera images. Gain references should be taken with many tens of thousands of total counts in order to work optimally. If your practice is to take gain references at a low number of target counts per image to match the counts in typical low-dose images, then you need to take many more reference images to compensate (e.g., 50 instead of 10). Increase the binning of the focus images, which will reduce the height of the shrap peak at 0,0 relative to that of the real correlation peak. For typical applications, binning to 2 or even 4 will probably not affect the accuracy of the focus measurement, because there is sub-pixel interpolation when measuring the shifts. However, the autofocus routine ordinarily does not apply binning to images that it receives, so it is necessary to apply the needed binning during acquisition. The exception to this situation is available in SerialEM 4.5: for direct detectors, where adequately binning may easily saturate a 16-bit image, the Set Min Binning command can be used to make the autofocus routine apply binning before correlation when necessary. Set program properties to apply a stronger high-frequency filter to the images. This filter can be controlled by entries in the file SerialEMproperties.txt: 'FocusFilterRadius2' for the cutoff frequency (default 0.25/pixel) and 'FocusFilterSigma2' for the Gaussian rolloff of the filter to zero (default 0.05/pixel). Smaller values are used to apply more filtering. In SerialEM 4.5, the Test Filter Cutoffs command can be used to experiment with different values. Thus, with this version, if you have the set of three images from a failed autofocus in buffers A, B, and C, you can adjust either the filter with this command or the minimum binning with Set Min Binning then run Report On Existing to see if it gives a correct result. For target defocus near zero, use a negative 'autofocus offset' to have the images taken at a defocus sufficiently different from zero. In that case, the program will reject a large correlation peak at 0,0 when there is another reasonable-sized peak closer to the expected defocus. This central peak rejection automatically takes care of moderate fixed-noise problems for low-dose imaging with a large enough negative defocus (below about -3 microns). This approach may reduce the absolute accuracy of the focus measurement but not necessarily its reproducibility. Some specimens show low or virtually no shift between the beam-tilted images at the highest tilts, usually only above about 50 degrees. The sign of this problem is a measured defocus near zero even when the defocus is several microns or more, coupled with the absence of appropriate shifts between the autofocus images. If the target defocus is not also very near zero, then the program will repeatedly change the focus by the target value, resulting in a runaway focus. There is a procedure, Check Autofocus, that can be run to check for this kind of problem; it measures defocus 5 microns above and below the current defocus and reports how much of the actual focus change it can detect. This routine can be run automatically at the start of a tilt series, which is useful when running tilt series in one direction from high tilt. There are two different strategies for dealing with the problem. Some users have found that the problem occurs mainly when the beam-induced shift is largely perpendicular to the tilt axis, and that it helps to choose a beam tilt direction that makes the image shift parallel to the tilt axis. In order to use this solution, you need to find this direction, then calibrate autofocus for that beam tilt direction. With the Set Tilt Direction command, you can pick one of 4 directions, spaced 45 degrees apart. To find the right direction, select a direction, run Report Shift & Drift, and toggle through the images to visualize the direction of shift. Repeat for each direction and pick the one where the direction of shift is closest to parallel to the tilt axis. If you actually have a failure case at high tilt, you should also see whether that direction indeed gives the best shift. Calibrate autofocus with best direction selected, and use it thereafter. Set an autofocus offset that is the negative of the target defocus; i.e., a positive offset for the typical negative target. This is not a very good solution; it will prevent runaway focus but not fix an incorrect defocus. When running a tilt series in one direction from high tilt, you need to get the focus right at high tilt before starting and hope that it does not get off very much before autofocus starts working better. The strategy should work better when running bidirectionally from zero tilt, because the specimen will be at the proper focus when it reaches the troublesome tilts, and the program can predict how focus should change as it goes through the final tilts.